40,000 people (approximately) attended the AD Home Design Show earlier this month. Architects, interior designers, retailers and wholesalers, students and journalists, artists and gallery owners, casually meandered up and down the aisles of Pier 94 in Manhattan, finding fun, unique, modern, and traditional designs and products that inspire new and clever answers to the client question, “What should/could my space(s) look like?” The challenge of the interior design, architects, retailers/wholesalers, is to determine what will satisfy the wants/needs of the client. 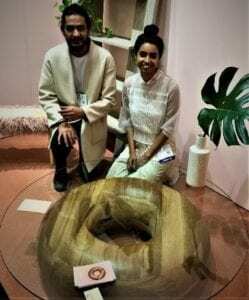 For interior designers looking to bring interest to potentially boring lobbies, hotel rooms, cafes and coffee shop space, the AD show offered a myriad of new and inspiring options that deliver the WOW, replacing the MEH! Harber’s creative palette runs the gamut from copper and bronze, to stainless steel and stone. He takes these metals and handcrafts them into elegant works of art that forces us to stop and consider the beauty of the pieces on display. Harber works from his Oxfordshire studio and is inspired by optical illusions found in nature. He mixes clean line, bold physicality and a palette of pixelated reflected color that takes our visual space to a new level of interest. Regardless of the shape, the sculptures present an organic essence that can be mesmerizing. Clients include: Hotel Conrad Algarve, Portugal; Four Seasons Hotel, Dubai; Festival City, Doha, Qatar; Fregate Island, Seychelles; Hotel du Cap-Eden-Roc, Antibes, France; Hyatt Hotel, Birmingham, Alabama; Peninsula Hotel, Paris, France; Raffles Hotel, Dubai; Sandy Lane Hotel, Barbados; Royal Birkdale Golf Club, Southport; Sofitel London Heathrow at Terminal 5; Sofitel Hotel, Gatwick airport. Soft-geometry introduces a range of solid wood furniture inspired by desserts. The Coffee Table is a dense swirl of solid Oak, rich with varying grain and gradient in clear caramel finish. The designs are inspired by the creativity of desert chefs who create cakes, truffles, tarts and eclairs from basic staples of milk, flour and eggs. Soft – geometry is a collaborative design studio that explores opportunities for softness, slowness and intimacy, built with time and process, in furniture and home objects that are the antithesis to what is big, bold, and fast. The pieces explore the concept of “forever” using form, color and materials that act as bridges to artisan crafts and handmade processes on one hand and the forms, language and efficiency of modern manufacturing on the other. Facture Studio is a contemporary art furniture company directed by designer, Quincy Ellis. He can be found in Brooklyn, NY, where his dynamic molded works use resin to experiment endlessly with light, color and transparency. Core elements of his work include designs that change colors, shades, shift patterns, opacity and interior core colors. Facture seeks to blur the line that often separates art from design. Through the use of new techniques and experiments, the brand seeks to establish itself in the world of design. The tables, chairs, and lounges are perfect for boutique hotel rooms, poolside cafes and set the inspiration for children’s playrooms as well as informal dining rooms. The Richard Clarkson Studio is located in Brooklyn, NY and it is an art and design laboratory where the pieces are inspired by the celestial. Members of the studio have backgrounds in art, design, science, engineering and business. The Studio philosophy is inspired by the stars and the fact that we “form patterns in the sky to predict the weather, find our way, tell stories…” Many cultures have “interpreted” the stars in their own way, creating stories and legends about the clusters of suns, burning millions of miles away.” The lighting fixtures combine wit with whimsey and are perfect unique additions to dining rooms, cafes, informal lounge areas as well as for adult and children playrooms. Kristof Galas was born in Poland (1977) and relocated to London (1997). He received a Bachelor of Arts degree from Chelsea College of Art and Design, University of the Arts, London (2007). Although Galas’ degree was in architectural design, his passion focused on art. International travel has inspired his ideas and he has spent years exploring form and color and experimenting with different techniques and mediums. Currently he concentrates on oil and enamel painting and his works explore opportunities available from reclaimed and recycled paint as part of his concern for the environment. He continues to explore texture, colors and forms that come from medium intended for other tasks. Chatterley was awarded a Bachelor of Fine Arts, Department of Art, from Michigan State University (1979) where he graduated with honors, and a Master of Fine Arts, in the Department of Art, Michigan State University (1981). He also studied at Northern Michigan University (1975, 1977). Chatterley considers the dream world, the real world, and the space that exists in-between. He creates each clay sculpture from the bottom up – starting with an 8-inch slab of clay and slowly building forms, allowing each section to set up before the next slab is attached, spending weeks building each figure. The rough surfaces are part of his signature, “They are like dug up relics of a time to come.” Each piece is fired twice with the second firing hot enough to vitrify the clay, allowing the sculpture outdoor existence, year-round. His works are creative, playful and intriguing, making them perfect additions for hotel lobbies, airport executive lounges, casual dining spots and children/adult playrooms. Ara Thorose is from Detroit, Michigan and holds an MFA in 3D Design from Cranbrook Academy of Art. His works explore post-industrial structures through lab-based experimentation and intuitive play. In his series, tubular group 01, the collection, composed of three distinct sculptural pieces evokes a 3-dimensional line drawing of a chair, created with a number of different movements. 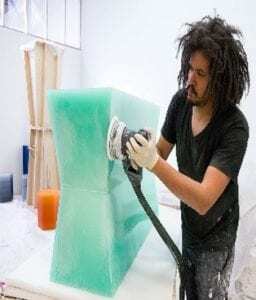 His art/furniture works are hand fabricated in his Detroit studio using a rubber welding technique that incorporates repurposed industrial tubing, PVC, aluminum, foam and steel. He credits the Motor City as a critical force behind his postindustrial forms and choice of materials. Thorose’s unique seating arrangements are perfect additions to contemporary rooms in boutique hotels, outdoor wine bars and tasting rooms, as well as playrooms and beachside restaurants. True has a sterling reputation in the commercial refrigeration space and has enlarged its focus to include refrigeration in personal zones, making it the perfect product for hotel suites and other shared accommodations. The company is family owned and run and the products are manufactured in the USA. True has added eye appeal to a product that normally goes unnoticed through its “Color My World” line of refrigeration. The vibrant colors and attention to detail makes this boring necessity an attractive addition to a modern kitchen and an interesting way to bring WOW to the hotel suite dining/cooking space. The product has been designed through consultations with the best chefs in the world and how they operate in their restaurants, combined with what consumers want when they cook for themselves and their families. Function and form are combined with good design, to make the product attractive as well as useful. 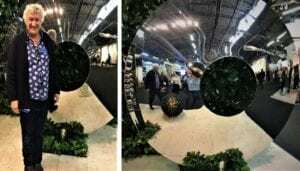 The big reveal at the AD show was Emerald (custom finish) that is noted as representing wellbeing, balance and harmony. With True, designers can choose from 49 unique combinations of custom finishes and hardware in both full-size and undercounter units. They look real but they are really FAUX botanicals…and they fooled me. In the early 1990’s, Ed Glenn was working in his family flower shop in Greenville, North Carolina and he had an idea. Although the family business was a success (his arrangements could be found at the White House and State dinners), he was frustrated with the perishability and challenges of working with fresh flowers and wanted high-quality alternatives. Although he had no background in production or manufacturing, he started to assemble a few simple Paperwhite Narcissi, set in rustic terracotta pots, with different materials and tools. For the base he developed a permanent dirt mixture that imitates natural soil and now known as Durf. Today the company occupies 60,000 square feet of production and design space and is a leading provider of high-end artificial plants and greenery. Every Faux-Fresh arrangement is designed by Glenn and a team of designers who hand – assemble the displays in the most realistic botanic reproductions possible. Each plant looks as real as if it were delivered by Mother Nature herself without the upkeep and concerns brought about by climate change, active passage ways and children with sticky hands. Home Depot expands its inventory to include product lines acquired through acquisition of The Company Store. Now, with one-stop-shopping, buildings and rooms can be built and furnished via Home Depot. The Company also expands the Home Depot customer base with a heavier skew to women, higher income and older, overall most comparable to Bed Bath & Beyond. Currently, Home Depot is the world’s largest home improvement specialty retailer with 2,284 stores. In fiscal year 2016, The Home Depot had sales of $94.6 billion and earnings of $8.0 billion. Usually associated with tools, lumber, and home remodeling products, consumers can now indulge in buying home décor and textiles online. The Company Store was started in 1911 and the Home Depot purchase means that it is moving into the “soft home” space. Credit Suisse research analyst, Seth Sigman, finds that décor-oriented products, like nails, hammers, floor tiles and window treatments account for approximately $25 billion (25 percent) of Home Depot’s sales; décor alone is just $2.9 billion (3 percent of sales). The Architectural Digest show features the world’s leading brands and contemporary talent, presenting carefully curated presentations of design, including vignettes by respected designers, workshops and seminars, culinary demonstrations and special “star” appearances. The vendors represent industries that include furniture, fixtures, lighting, art, kitchen, bath and building projects. It is a reliable and comprehensive source for shopping and new ideas from new independent artists as well as established manufacturers. The Show attracts over 40,000 design professionals who have the opportunity to explore more than 400 brands. For additional information, visit addesignshow.com.